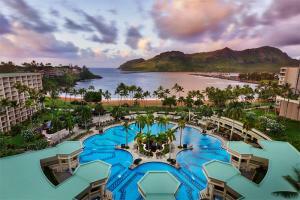 Marriott Kauai Beach Club welcomes you to a memorable vacation on beautiful Kalapaki Beach. With a convenient setting beside the Kauai Marriott Resort, you'll enjoy the benefits of access to a multitude of services and amenities. Refresh in the 26,000 square-foot heated pool featuring colonnades and waterfalls, or catch the last ocean wave as the sun sets. Here, you'll find beautiful courtyards lined with Hawaiian foliage and eye-catching art and prominent statuary. 232 guest rooms and villas offer a restful retreat with pillowtop mattresses and a host of thoughtful amenities. Order room service or dine out at the restaurants on site. Work out at the fitness center or pamper yourself with a treatment at the spa. The hotel offers complimentary airport shuttle service.